The opening day of the third Grand Slam of the year marked an important milestone on Saturday as the countdown reached 100 days until August’s all-star World Championships extravaganza in Budapest. Ekaterinburg, Russia, is the host city this weekend as the sport welcomes a new destination on the IJF World Judo Tour. As the fourth largest city in Russia, Ekaterinburg, is a natural choice as the setting for the Russian leg of the tour and the final Grand Slam before the Worlds. The Palace of Sports is hosting Olympic champions and world medallists among the star-laden entry as 286 judoka and 36 nations are on the tatami this weekend. 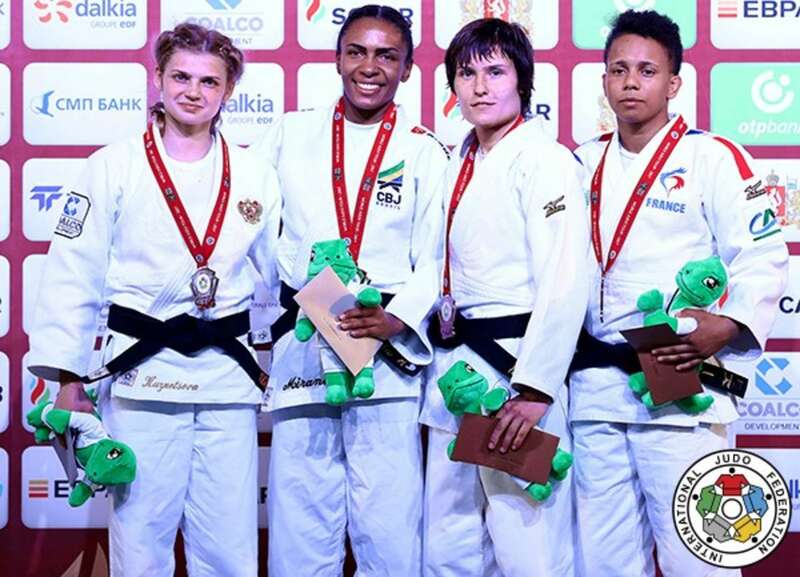 Seven weight categories are engaged on each day in the Urals and Saturday saw the women’s -48kg, -52kg, -57kg and -63kg judoka and the men’s -60kg, -66kg and -73kg judoka compete. 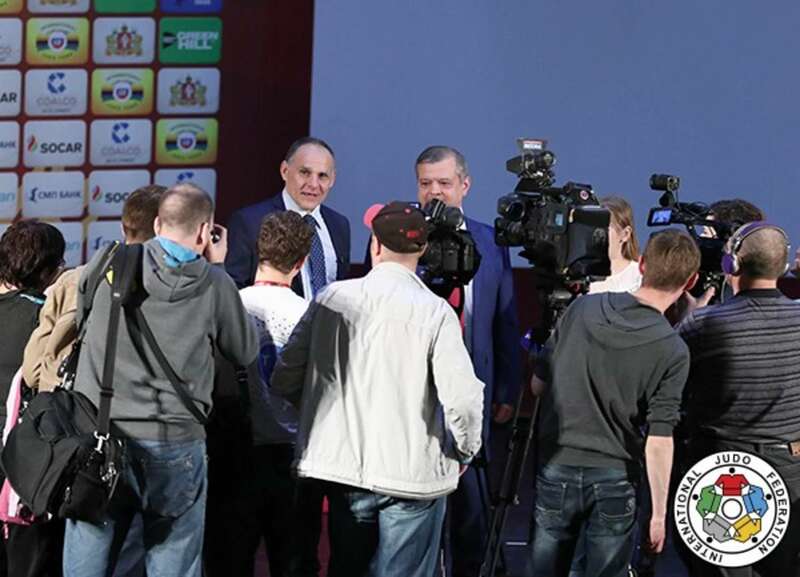 The Russian national team, who have entered 54 judoka this weekend, is steered by Team Manager Ezio Gamba. The 1980 Olympic champion and 1984 Olympic silver medallist, who was inducted into the IJF Hall of Fame in 2013, outlined his vision for the Russian team and discussed the make-up of their high-performance programme. “I set things up for four years or even eight years, this is the reason why I already set all projects for Tokyo 2020 Olympics,” said Gamba, who was also appointed as the European Judo Union General Secretary in April. “I started this project in 2009 and while now I also have an EJU role which can take up some time, I am fortunate that I have an organised team here in Russia which is full of leaders and supporters. “The head coaches are realty able to manage all the things, I am in connection with them at all times for planning and organisation which is all done by me. I am really satisfied with where we are and what we can do. “For our seniors, u23 judoka, juniors and cadet teams I set their targets and for me there is not a great concern about points or rankings. I take note of results in the European Championships and the World Championships but everything is a work in progress. I want everyone to finish each competition with an athlete having information and input on what they need to work on. Gamba went on to explain the numbers in each Russian team and their annual workload. “We have 70 men and 40 women in the senior team and the numbers are the same for the u23 group. “The senior group are involved in competing or training for 300 days a year with the u23 judoka working for approximately 240 days. Asked how the Russian team have enjoyed such consistent success, Gamba, detailed his theory and approach that has led to five medals at London 2012 (3 gold, 1 silver, 1 bronze) and three medals at Rio 2016 (2 gold and 1 bronze). “It is true that the results have been amazing and we have the top total number of medals in these eight years – no other nation is as high, so we have a high quantity and the quality is there. I prefer to have seven bronze medals in a Worlds than two gold medals because I have the belief that each of those bronze medals can become gold in the future. “When I started with the Russian Judo Federation, I said I don’t want to follow seven or 10 judoka, I want to be able to lead a team for three Olympic cycles. We have a fair number of staff certainly but when you compare it to France, who has four national centres and 2000 elite judoka in training, Japan has mass numbers in Universities and Brazil has some volume, we have modest numbers. Mr. Evgeniy KUYVASHEV, Governor of the Sverdlovsk Region, said: “Dear guests and participants, we are glad to welcome you all at this event at the cultural, scientific and sporting centre of Russia, Ekaterinburg. Mr. Valentin KHABIROV, RJF Vice President and Executive Director, said: “This is a welcoming speech on behalf of Mr. Vasily ANISIMOV, RJF President. Dear friends, I am pleased to welcome you to the first Grand Slam here in Ekaterinburg. “We are delighted that participants from all over the world are here in Ekaterinburg to compete in this prestigious event. 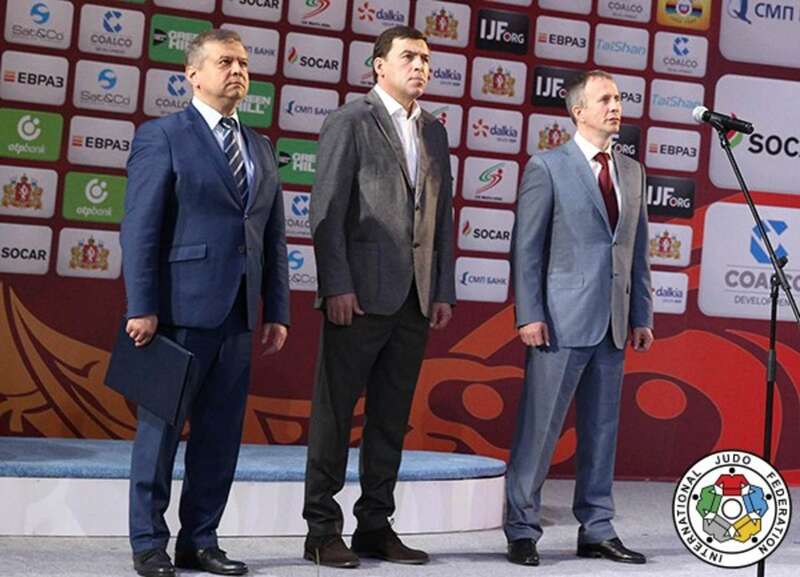 I am sure that this competition in the Ural region will motivate judoka for years to come and hope you will all have a wonderful impression of this hospitable city. 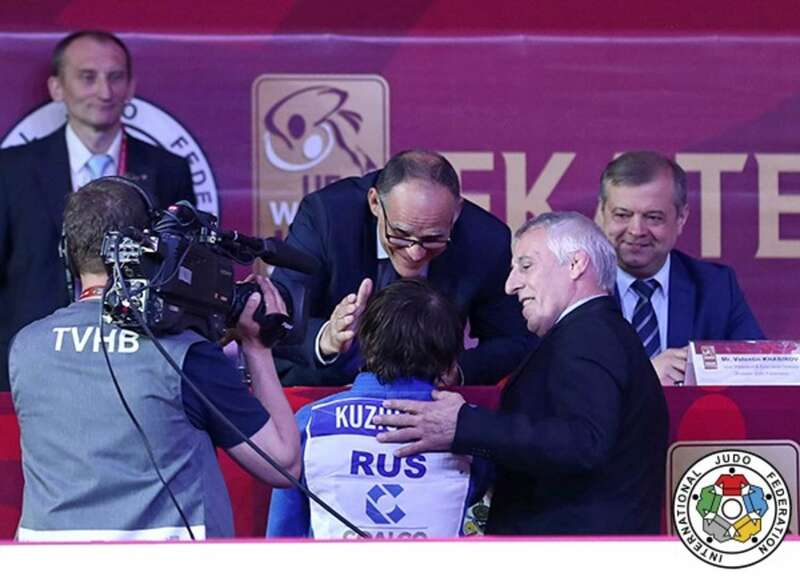 Mr. Sergey SOLOVEYCHIK, IJF Vice President and EJU President, said: “Dear guests, spectators and judoka, I am happy to welcome you to this Grand Slam 2017 competition and this message is on behalf of the IJF President Mr. Marius VIZER. Many judoka have arrived here from 36 nations and we have Olympic champions and world champions and many other exceptional judoka. 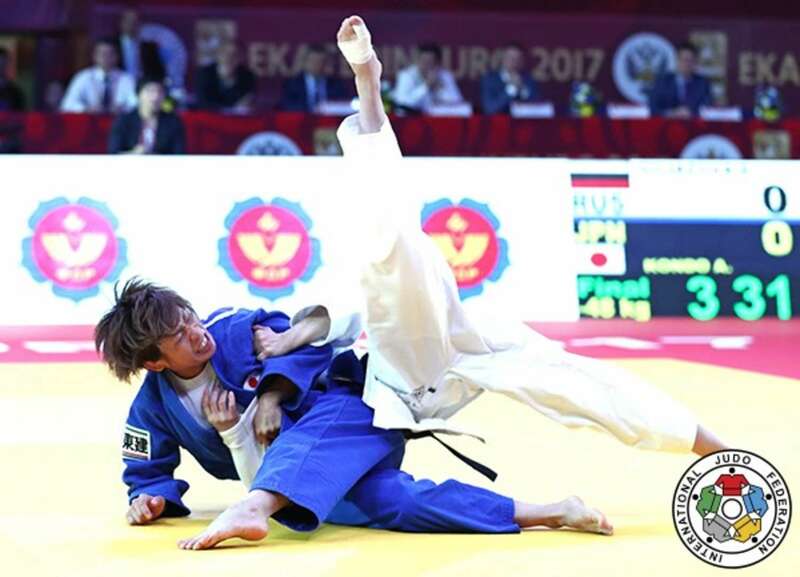 Rio 2016 Olympic bronze medallist KONDO Ami (JPN) showed that she is ready to challenge for a third consecutive Worlds medal this summer after a straightforward win in Ekaterinburg. Antalya Grand Prix bronze medallist Sabina GILIAZOVA (RUS) was unable to impose herself as class act KONDO held down the Russian with a ushiro-kesa-gatame hold for 20 seconds to clinch the gold medal. World number six KONDO, 22, had won successive Grand Slam bronze medals in Tokyo and Paris since Rio 2016 and was recently selected for this year’s World Championships. KONDO, who won the Worlds in 2014 and bronze a year later, is now in pole position for Budapest 2017. 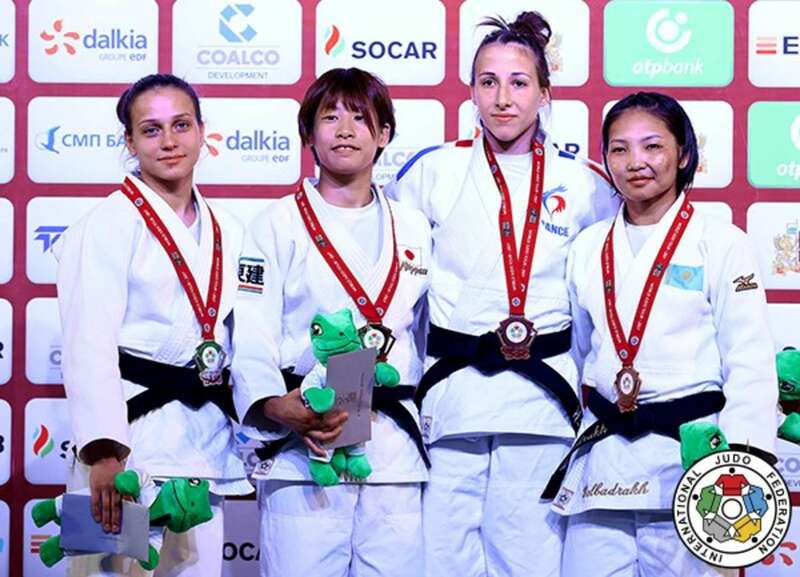 In the first semi-final GALBADRAKH was surprisingly beaten by GILIAZOVA by a waza-ari while in the second semi-final Tbilisi Grand Prix bronze medallist Melanie CLEMENT (FRA) fell to KONDO who trapped her opponent in osaekomi with a kami-shiho-gatame for 20 seconds and ippon. The first bronze medal contest saw Tashkent Grand Prix winner Mariia PERSIDSKAIA (RUS) tumble after only 16 seconds to CLEMENT. The French judoka produced a left-sided harai-goshi for ippon inside 20 seconds to capture her first Grand Slam honours. The second bronze medal contest went to world number two GALBADRAKH who salvaged a place on the medal podium despite being far from her best. GALBADRAKH prevailed as five-time Grand Slam medallist Nataliya KOMOVA (RUS) received her third shido in golden score to be disqualified and the Kazakh has work to do if she is to win her first Worlds senior medal in August. Three-time world medallist Erika MIRANDA (BRA) won the fourth Grand Slam gold medal of her decorated career as she beat European Championships silver medallist Alesya KUZNETSOVA (RUS) in the -52kg final. MIRANDA, who is only missing gold from her Worlds collection, won all four of her contests in Russia including a gusty display in the final to pull back the contest from ne-waza ace KUZNETSOVA who moved up from -48kg to -52kg in February. KUZNETSOVA scored first from a tate-shiho-gatame hold for 18 seconds and the knowledgeable crowd raised the volume inside the Palace of Sports whenever the contest reached the ground. MIRANDA levelled the score in regulation time with a waza-ari before rolling over her opponent in added time for a gold medal-winning score. In the first semi-final KUZNETSOVA downed former world bronze medallist Amandine BUCHARD (FRA) after three minutes and 25 seconds of added time. The home judoka rolled BUCHARD for a match-winning waza-ari as she came out victorious in a battle of two former -48kg standouts who have moved up to -52kg. In the second semi-final Olympic bronze medallist Natalia KUZIUTINA lost out to MIRANDA via a left-sided ippon seoi-nage which came after a titanic tussle. The Brazilian and the home judoka went over double their regulation time as four minutes and four seconds of golden score was needed to deliver to first and last score of the contest. In the first bronze medal contest Antalya Grand Prix silver medallist Gili COHEN (ISR) was held down by KUZIUTINA as the Russian won bronze to a loud ovation from her supporters. In the second bronze medal contest BUCHARD bested Pan American Championships bronze medallist Ecaterina GUICA (CAN) in 13 seconds. The French judoka, who has finally committed to the -52kg category having flirted with the division since 2014, won by ippon as she finally looks settled at her new weight category. Former world bronze medallist Miryam ROPER (PAN) exceeded all expectations on her return to the international circuit as she marked her first IJF World Judo Tour appearance for Panama by not only winning her country’s first ever IJF medal but also ensured that it was gold and therefore Himno Istmeño would be played for the first time. London 2012 and Rio 2016 Olympian Miryam Roper, 34, who was born in Germany to a German mother and Panamanian father, was deemed surplus to requirements for Germany following her second Olympics as they looked to move in a new direction and to introduce younger talent. 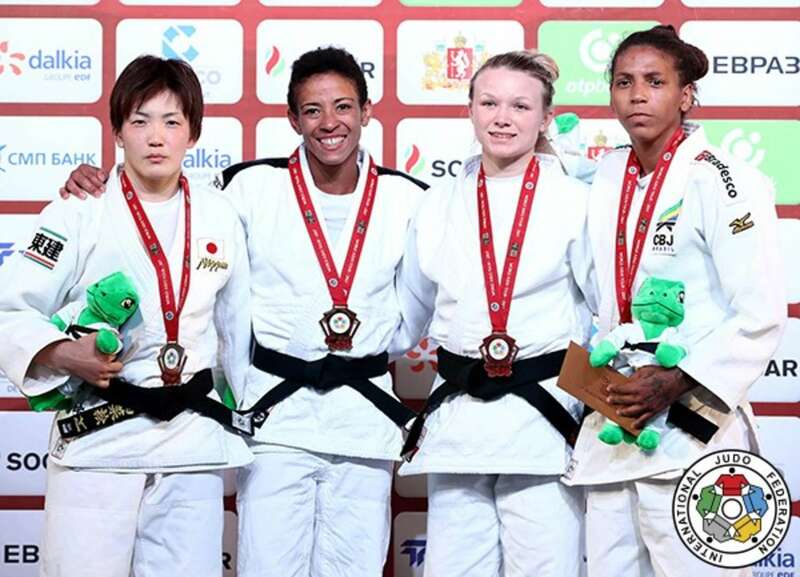 ROPER believed that she still had plenty to offer at the elite level and that was proved to be the case on Saturday as the -57kg judoka won gold for Panama. ROPER, who was funded to take part in Ekaterinburg by the IJF and fought without a coach, was opposed to former world champion UDAKA Nae (JPN) in the final and took control of an attack to set her opponent off balance for ippon as she broke down in tears of sheer elation having gone through every emotion imaginable in elite sport in the last year. 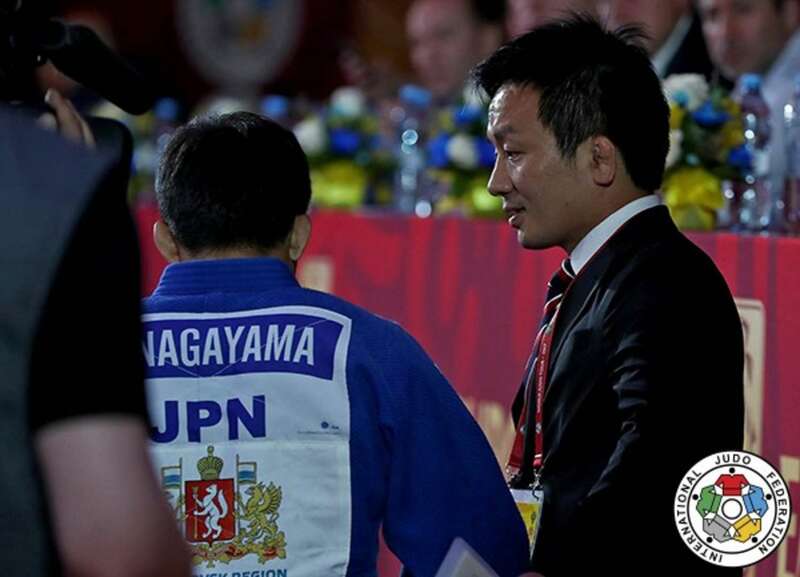 In the first semi-final Ulaanbaatar Grand Prix winner LKHAGVATOGOO Enkhriilen (MGL) was dismissed by ROPER who held down the Mongolian for 20 seconds to guarantee a first ever medal for Panama at this level. The first bronze medal contest saw beaten semi-finalist KLIMKAIT defeat Tyumen Grand Slam silver medallist Daria MEZHETCKAIA (RUS) to win her first Grand Slam medal with a morote-seoi-nage. MEZHETCKAIA had recorded a waza-ari of her own with the same technique but KLIMKAIT marginally outworked her opponent and was a worthy winner with a winning margin of one waza-ari. 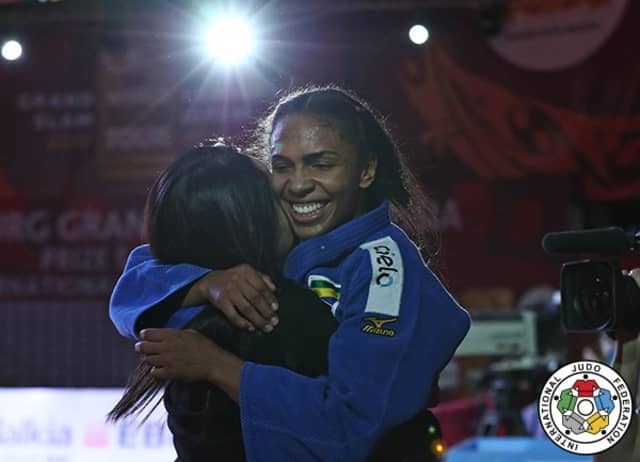 In the second bronze medal contest Olympic champion Rafaela SILVA (BRA) defeated 18-year-old LKHAGVATOGOO who put forward a respectable showing despite losing by hansoku-make for accumulating three shido penalties. European Games Martyna TRAJDOS (GER) topped the Grand Slam medal podium in Russia to cast herself forward as one of the top contenders for the World Championships. Tokyo 2015 Grand Slam winner TRAJDOS, 28, held down former European bronze medallist Ekaterina VALKOVA (RUS) for 20 seconds for her 10th Grand Slam medal and most important to date. In the first semi-final TRAJDOS held down Budapest Grand Prix bronze medallist Amy LIVESEY (GBR) for 20 seconds, ippon and a place in the gold medal contest. A kesa-gatame hold subdued the British judoka from St Helens who moved down into the bronze medal contest as a result of the defeat. In the second semi-final VALKOVA drove past Abu Dhabi Grand Slam bronze medallist Mariana SILVA (BRA) by ippon in just 17 seconds. The first bronze medal contest saw SILVA pick up a third Grand Slam bronze medal as former Pan American Championships bronze medallist Stefanie TREMBLAY (CAN) was disqualified with hansoku-make. 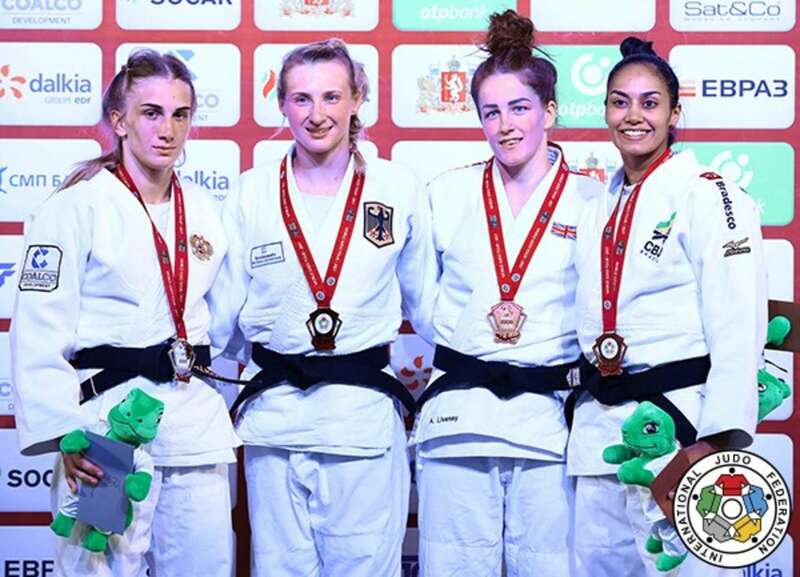 In the second bronze medal contest LIVESEY struck Grand Slam silverware for the first time as she beat Tyumen Grand Slam silver medallist Daria DAVYDOVA (RUS) by a waza-ari score after four minutes. 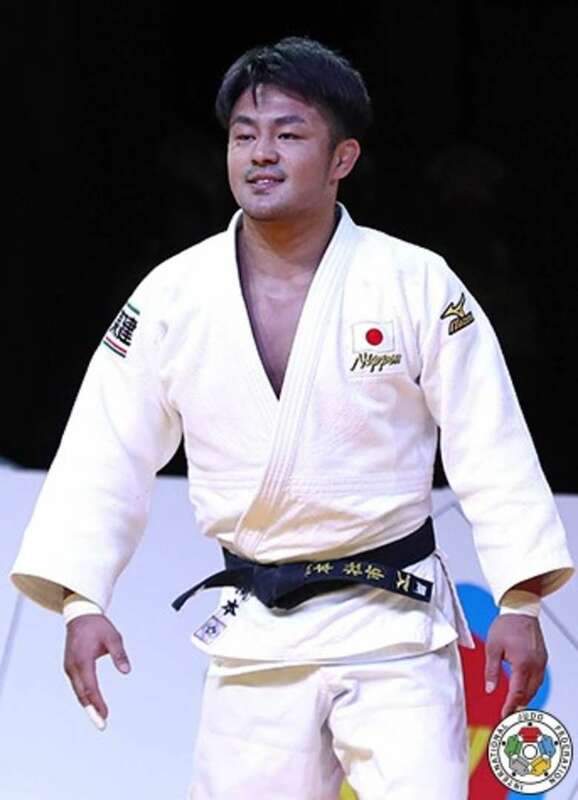 Tokyo Grand Slam winner NAGAYAMA Ryuju (JPN) outshone former European Championships winner Amiran PAPINASHVILI (GEO) by registering three scores without reply. The 21-year-old unleashed a torrent of attacks as he opened with a waza-ari from an uchi-mata after 40 seconds before adding a waza-ari from a modified ura-nage. 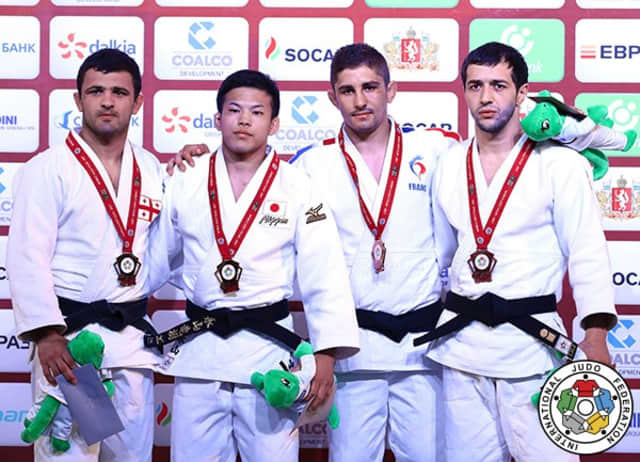 NAGAYAMA, who will join Olympic bronze medallist TAKATO Naohisa as his country’s -60kg judoka in Budapest, added a third waza-ari with ashi-waza and comfortably saw out the clock to earn his finest international triumph of his young career. In the first semi-final PAPINASHVILI (GEO) beat former Junior World Championships winner Francisco GARRIGOS (ESP) by ippon after only 26 seconds. In the second semi-final NAGAYAMA registered three waza-ari without reply against Savva KARAKIZIDI (RUS) before putting the Russian judoka out of his misery by ippon. The first bronze medal contest was won by Abu Dhabi Grand Slam bronze medallist Cedric REVOL (FRA) who defeated KARAKIZIDI by a waza-ari from a drop seoi-nage after four minutes of action. In the second bronze medal contest GARRIGOS suffered his second defeat in a row as Abu Dhabi Grand Slam bronze medallist Albert OGUZOV (RUS) was designated as the winner by ippon after 14 seconds. Antalya Grand Prix winner Abdula ABDULZHALILOV (RUS) made his Grand Slam outing count on Saturday as he methodically worked his way to the top of the -66kg medal podium. The Russian judoka won his country’s first gold medal at their home Grand Slam when two-time Grand Slam winner Charles CHIBANA (BRA) attempted to turn out of a throw by bridging and that is not legal due to the risk of injury for the athlete and the Brazilian was disqualified. In the first semi-final Tokyo Grand Slam bronze medallist DOVDON Altansukh (MGL) succumb to ABDULZHALILOV with a booming seoi-nage for ippon. 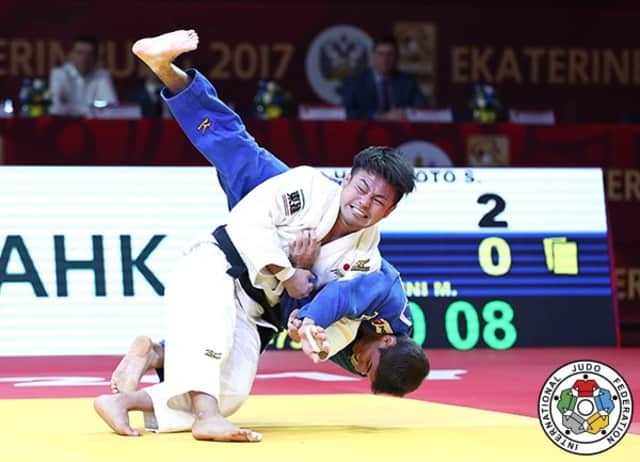 In the second semi-final CHIBANA dramatically came from behind to deny Tbilisi Grand Prix bronze medallist Yakub SHAMILOV (RUS) a home final. The Brazilian trailed to a waza-ari from a tani-otoshi but with six seconds left on the clock the former picked up his Russian rival and dispatched him for ippon. 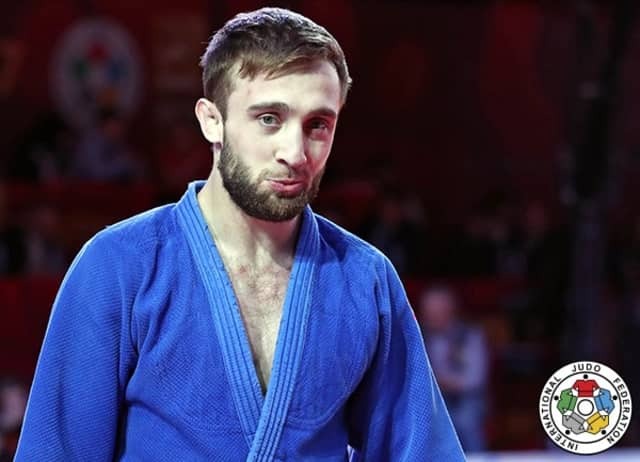 The first bronze medal contest saw Junior European Championships winner Dzmitry MINKOU (BLR) beat DOVDON by ippon for his first Grand Slam podium. The 20-year-old shocked his accomplished Mongolian opponent by ippon as Belarus were off the mark in Ekaterinburg. 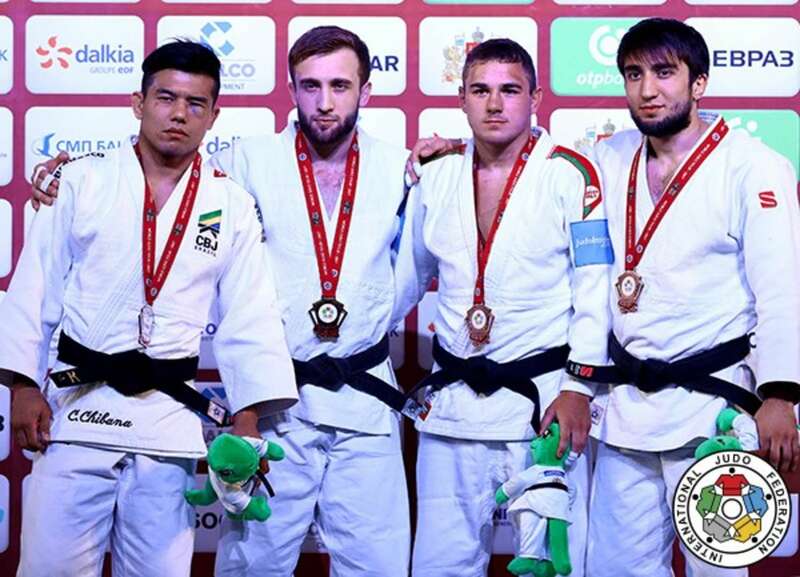 In the second bronze medal contest Casablanca African Open winner Islam KHAMETOV (RUS) edged out SHAMILOV (RUS) by a waza-ari to grace the medal podium. 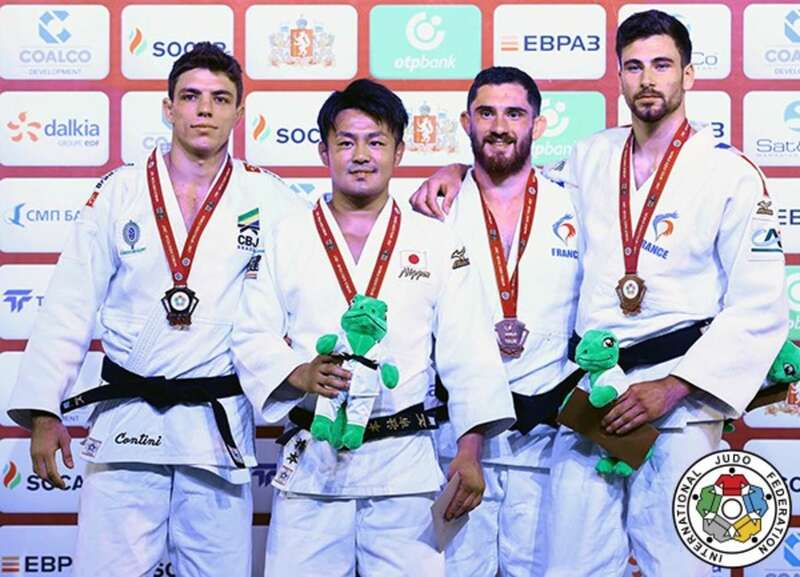 Sensational HASHIMOTO Soichi (JPN) won his third career Grand Slam medal as Japan were irresistible on day one in Russia. World number two HASHIMOTO, who is undefeated on the tour since 2015, maintained his unbeaten run that could well extend beyond his first World Championships in August. HASHIMOTO, who is only behind Rio 2016 Olympic silver medallist Rustam ORUJOV (AZE) on the World Ranking List, routed surprise finalist and Lima Pan American Open winner Marcelo CONTINI (BRA) with two waza-ari scores going unanswered before the Japanese ace made sure of gold with a beautiful sode-tsurikomi-goshi throw for ippon. In the first semi-final HASHIMOTO defeated former Pan American Championships winner Arthur MARGELIDON (CAN) with a tai-otoshi for ippon. In the second semi-final CONTINI (BRA) bested former Glasgow European Open silver medallist Sam VAN T WESTENDE (NED) by ippon after 67 seconds to remain fresh for the final. In the first bronze medal contest VAN T WESTENDE could not escape the clutches of Pierre DUPRAT (FRA) in osaekomi as the latter wrapped up the Dutchman with a tate-shiho-gatame hold to win by ippon. In the second bronze medal contest former Junior European Championships winner Benjamin AXUS (FRA) also pinned down his opponent for bronze. The young Frenchman saw off MARGELIDON to match his countryman DUPRAT.